Arrived quickly and safely. Great transaction and product! Just as described. Super fast shipping. Great seller. Really easy way to get the windshield clean without popping your arm out of socket. You can easily get the entire windshield clean without much trouble. The only issue I had was the microfiber cloth that comes with it could be of better quality. It does the job but does take some extra effort. Other than that it's great. You can easily touch up a spot on the windshield while you're sitting at a traffic light if need be also. I purchased this as a replacement for my Telebrands windshield cleaner. It makes cleaning the inside of your windshield so much easier. What I received is a cheap Chinese knock off (but then, isn’t just about everything?) of the original product. The handle is all one piece, and does not break down for easy storage in the glove compartment like my original. It is also hollow and open on one side, making it less sturdy and not very ergonomic on the hands. The microfiber bonnets are fine (and what I ordered it for anyway, as I needed replacements). It remains to be seen just how long they last. The water spray bottle is a waste of time. From the looks of it, it won’t last very long anyway. But then, neither did my first one. Bottom line: If you are looking for an easy way to clean the inside of your windshield, this will do the trick. If you are looking for something that you will be able to use for years to come, and clean a lot of windshields, keep looking (and watch for the “Telebrands” name). It is of much better quality. It's lightweight, but sturdy enough for the job it is designed for. 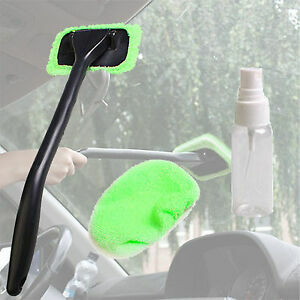 Very helpful and resolves safety issues with fog that forms on the inside of the windshield. It really enables me to clean the hard-to-reach areas. It's great for reaching hard to reach areas. The downsides are that it seems to just push the dirt around instead of absorb and remove it. Maybe I am doing it wrong. Another thing, this item comes with two cloths. I can't find anyone who is selling refills of just the cloths. That's a bumber because I lost one of mine in the laundry. I have found that if i put a paper towel over the cloth and use it that way to clean, it tends to clean much better. Inside windshield cleaner or smearing stick? The item you get with purchase is slightly different then in the photo the mine felt cheap but it was only 5$ but I hoped it would at least clean it did not clean well at all! dry with water with soup with cleaning spray with anything just smeared stuff around. if you use the edge of it you can actually clean very small areas OK. The lil spray bottle is handy tho! And very useful!